Try as I might, I could never get any of my children interested in model kits. I grew up in the 1970’s and I have fond memories of sitting in the living-room, at a card-table covered with newspapers, and gluing and then painting plastic model kits. I didn’t spend much time looking at manufacturer names … a kit was a kit to me. Was the design interesting? Did the box cover art draw me to the model? But as I read through this book I realize that most of the kits I worked on were Aurora model kits. What drew me to this book was the cover and that picture of the Frankenstein monster model. That particular model kit was a turning point for me … possibly the kit that got me most interested in doing models. I also remember it being the winter of 1968/69 and I spent a lot of time getting it ‘just right.’ From there I went for the Dracula glow-in-the-dark kit, which I thought was just about the best thing I’d ever had a chance to make, and that led to a whole variety of model kits, from cars, to planes, to ships, and of course plenty of tv and pop-culture related kits (I loved that Beatles yellow submarine that you were supposed to put a coin in to help make it sink in the bathtub!). And if you can’t tell by the above paragraph, reading through this book brought back a flood of fond memories. I have a couple of un-opened model kits that I’d purchased (years ago) for my children, but when they didn’t show any interest in them I put them aside. Reading through this book made me want to go open one of those kits and experience the joy of carefully removing the pieces from the plastic stem; file the excess plastic off, very carefully, and begin gluing the pieces together (and likely getting glue all over my fingers!) so that I could get something that I could then carefully paint. The first portion of this book is a well-researched history of Aurora: their start-up plans, the people behind the company, and how they got in to model kit making, as well as how some of the kits were received and who designed them. It’s a tremendous biography of a company and very interesting reading. It also details the decline of the company and how other companies purchased some of these model kits. The book is tremendously illustrated with photographs – not just of the model kits (though there is plenty of that), but also of the organization and the people who made Aurora what it was. The second portion of the book is a comprehensive list of all of the models manufactured by Aurora, with kit numbers, and many of them with photographs of the boxes (and some of the completed models). It’s a great checklist and a super trip down memory lane for some of us. I loved going through this and thinking, “Oh, yeah, I had that one, too!” I’d forgotten just how many different model kits I had put together through the years until I read this book. All in all, this is a really remarkable history of a small business that had a big impact on popular culture and hobbies during its peak years. It is worth reading. Looking for a good book? 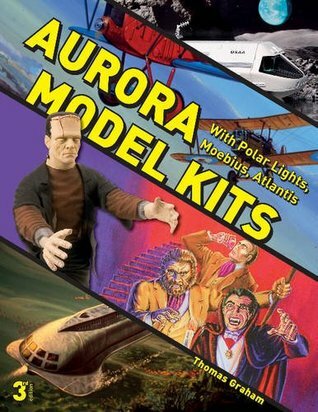 Aurora Model Kits: With Polar Lights, Moebius, Atlantis by Thomas Graham is a tremendously researched and thorough book about Aurora model kits, and is a nice addition to any library.